Rajiv Gandhi International Cricket Stadium is the principal cricket stadium in Hyderabad, India and is the home ground of the Hyderabad Cricket Association (HCA). It is located in Uppal, an eastern suburb of the city. It has a capacity of 55,000 spectators presently and extends across 16 acres of land. 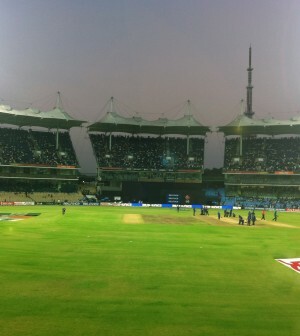 The jinx about this stadium is that the home team has never won a match here, but this was broken when Deccan Chargers defeated Royal Challengers Bangalore on April 14, 2011. HCA’s previous home ground was the Lal Bahadur Shastri Stadium in the Fateh Maidan sports complex at Basheerbagh in central Hyderabad. The ground belonged to the Sports Authority of Andhra Pradesh (SAAP) and HCA had limited operating autonomy over this ground. Moreover, due to its smaller size, it soon came to be known as a high-scoring ground and so Hyderabad was not considered for many high profile cricket matches in India. In 2003, the proposal for a new stadium was submitted by HCA to the government of Andhra Pradesh, then headed by N. Chandrababu Naidu. The proposal was quickly cleared and HCA was allocated a budget for the same. The government also identified a large piece of land suitable for the project at Uppal. Most of the funding for the project came after an open auction of the stadium’s title was held. Visaka Industries Limited won the auction with a bid price of Rs. 65,00,00,000. A sum of Rs. 43,00,00,000 was paid in advance and the stadium was named as Visakha International Stadium in 2004. By 2005 when most of the stadium was built, it was ready to host its first ODI Match between India and South Africa. However, Y. S. Rajasekhara Reddy the former Chief Minister of Andhra Pradesh decided to change the name of the stadium to Rajiv Gandhi International Cricket Stadium, in memory of the former Prime Minister of India Rajiv Gandhi. Following this decision, HCA was required to pay Visakha Industries six times the contract price in accordance with the contract clauses governing any subsequent renaming of the stadium or the Visakha name not remaining attached to the stadium. HCA however, following some negotiations by Govt, got away by paying an amount of Rs. 43,00,00,000, i.e. the contract price only.Now Rajiv Gandhi International Cricket Stadium is regarded one of the Professional and good Cricket stadiums and it has a capacity of 55,000 spectators.